The slip and creep in the belt or rope drives is a common phenomenon, in the transmission of motion or power between two shafts. The effect of slip is to reduce the velocity ratio of the drive. In precision machine, in which a definite velocity ratio is importance (as in watch mechanism, special purpose machines..etc), the only positive drive is by means of gears or toothed wheels. Addendum:The radial distance between the Pitch Circle and the top of the teeth. engagement of a given pair of teeth. teeth and the Pitch Point. contact of the gear teeth. 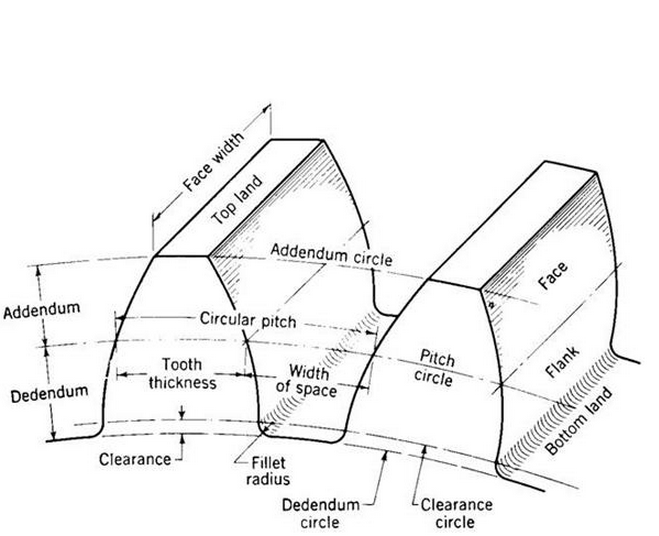 Circular Thickness: The thickness of the tooth measured along an arc following the Pitch Circle. Wheel:Larger of the two meshing gears is called wheel. Pinion: The smaller of the two meshing gears is called pinion. Module: Ratio of Pitch Diameter to the number of teeth. Diametral pitch: Ratio of the number of teeth to the of pitch circle diameter.